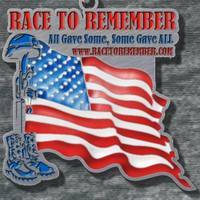 About Race to Remember – Memorial Day Race ALL GAVE SOME SOME, SOME GAVE ALL today we will honor all those men and women that have so bravely made the ultimate sacrifice for our FREEDOM. We will start all race at the Vancouver “Remembrance wall” on Columbia and Phil Arnold Way and head east along the waterfront. ABOUT THE RACE:” Our “Race to Remember” Memorial Day Race is a timed event, which is open to the public on Memorial Day (Monday 5.29.17). We want to honor all military fallen heroes, which is why the start/finish is at the Memorial Wall on Phil Arnold Way on the corner of Columbia Way in Vancouver, Washington. The Half marathon, 10K and 5K Route is an out and back course on the Columbia River trail. The first Half Mile is our Honor Mile, where we will line the pathway with the American Flags and pictures of military fallen heroes. The Honor Mile is a community walk and meant for us to slow down as a community and remember the sacrifice of our military heroes. After the run enjoy Vendors & Meet Vancouver Veterans. PureKraze | http://purekrazeveteransvillage.com : Mission to build homes for homeless veterans. At packet pickup and Race day .